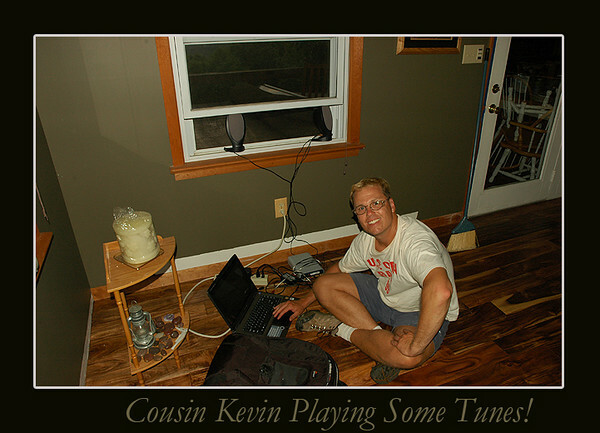 My cousin Kevin has visited the cabin a couple of times over the past several years. In February 2006, he visited with his family (Jennifer, Matthew, Sarah, and Julia) during the coldest weekend I've ever experienced on the mountain. This time--in August 2007--he came to work, and work he did! I truly appreciate Keb's work during the installation of my floor. We had a great time playing old tunes, drinking Leinenkugels, and making a trip down to town. I should also note that Kevin's 2007 visit was during the hottest weekend I've ever experienced on the mountain!